Hello, Gorgeous! : getting to the point. I seem to be having a (very extended) moment with pointy toe pumps. I just can't get enough of them! And last Spring when Prabal Gurung collaborated with Target, I bought two pointy toe pumps from the line and I'm still thrilled. Great buys just keep on giving! Love your bracelet and your multi coloured pumps are adorable! Lovely outfits! LOVE pointy toes. I've never been a fan of round, I can handle almond... but pointy will always be my first love. In the last year or so I realized that pointy toe flats exist (um, duh.) and it rocked my world. I have never owned pointy toed shoes. I like that yours aren't as extreme as some. 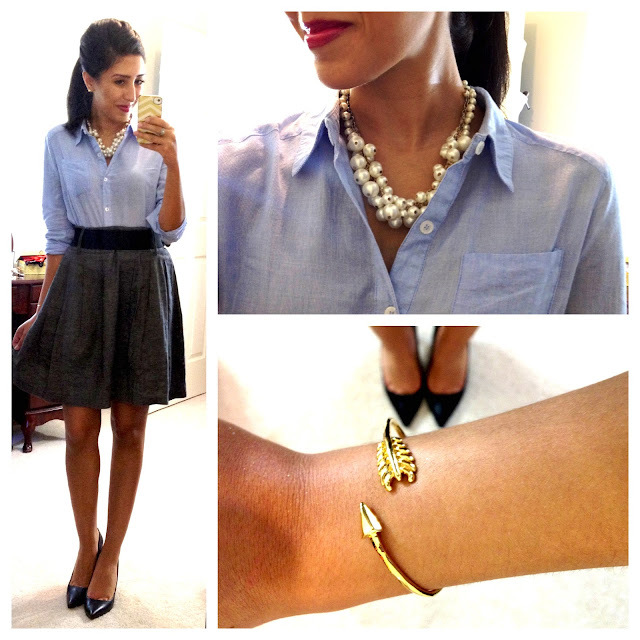 You are my go to fashionista for business wear! I love your blog and your style. And the best part is that it is all so affordable. Amazing! I love your style your such an inspiration to me! They look great on you! For some reason I just can't ever see myself wearing them... perhaps its because I'm so used to rounded toe shoes. Thanks for the outfit inspiration! Please do hairstyle videos. I love the way you do your different hair looks. Love all the outfits too! !